Most painters in the Dutch Golden Age would set up studios in rooms with windows facing the North, this way the light is constant and doesn't change on the subject. The good news in a photography studio is that you can have strobes so it doesn’t matter where the windows are as long as you can control the light coming in. That being said, getting the lighting of a specific painting can be quite tricky. 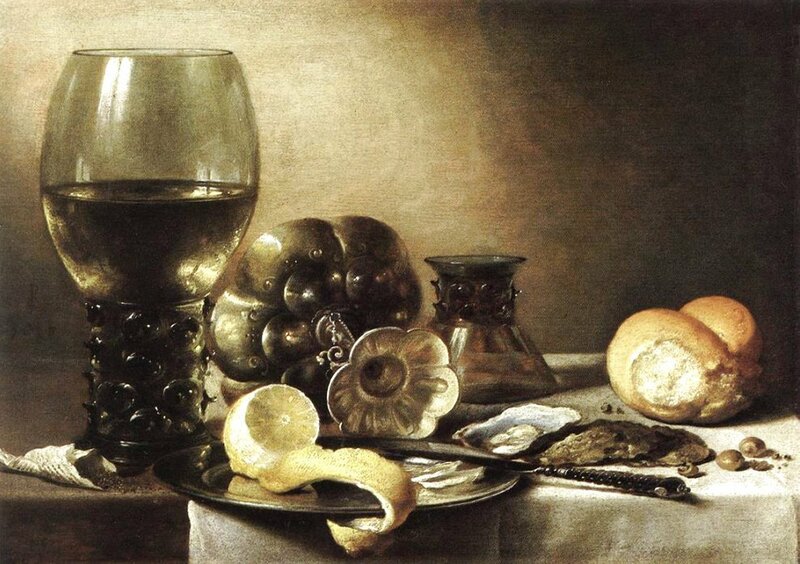 Let’s take this painting from Pieter Claesz. There is the obvious light coming through the window and hitting the wall. Apparently the same light source hits the roemer on top and the tazza behind. Somehow this magic light also touches the edge of the bottom of the tazza and perfectly illuminates the flat surface of the cut lemon. When I set up my lights for this shot, I started with a main light and add more as I needed. I ended up with four as seen in the picture at bottom right. 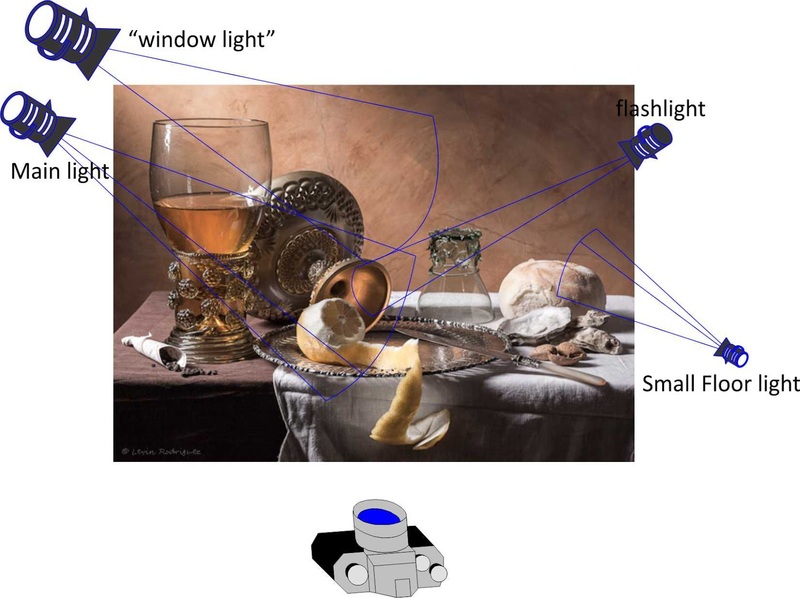 Unlike Claesz, I set up a third light under the table to achieve a chiaroscuro treatment, I like that to give more depth and separate the table from the background. Now, you can see that this fourth light is not exactly in the same direction of Claesz’s, (my lemon is not illuminated in the same manner) the reason is that if you place a light at that angle to get both the lemon and the edge of the tazza, you would not get the shadow under the silver plate at the edge or the darker part of the table cloth. This is how I knew that Master Claesz cheated in his lighting, which was a normal practice at the time. This stresses the fact that we can’t take these paintings as documents recording facts the same way we take photographs. Which is an intrinsic part of why we call it art, not documentary. Trying to reproduce these paintings have been a great learning experience and have given me some inside about the paintings themselves, extending my enjoyment and understanding of them, Dutch society at the time and Art in particular..